Nicholas Sanitation, Inc. is the certificated private trash hauler for nearly all of Nicholas County with some rights extending past county lines. These areas are described in detail by a certificate governed by the West Virginia Public Service Commission. The company was started in June 1977, with only 3 trucks, 5 employees, and 1200 total customers. The company has grown to currently employee 21 people, service approximately 500 commercial customers / 5000 residential customers, and operates a fleet of over 20 trucks. Nicholas Sanitation, Inc. originally was located in Cottle, West Virginia in .5 acre lot with no garage. The company moved to 17 Elk Lane in Summersville, West Virginia in November 1978. This location houses a 75’x40’ office/garage complex on 4.12 acres. This move was to accommodate current and future growth. The company uses its knowledge and resources to offer many types of services. 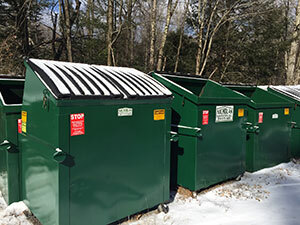 Nicholas Sanitation, Inc. offers residential and commercial trash services. Commercial operations include offering dumpster services, and 20, 30, 40-yard roll-off containers, including close-top roll-offs for customers who desire. Also, Nicholas Sanitation, Inc. offers specialty pick-up services for commercial and residential customers to satisfy various requests. Nicholas Sanitation, Inc. has also recently acquired a building on 1.10 acres adjacent to their current operation that will be home to their new recycling center. Nicholas Sanitation, Inc. will accept mixed paper, cardboard, aluminum& steel cans. The recycling center will be open to the public from 8:00A.M. to 4:00P.M. on Monday through Friday.